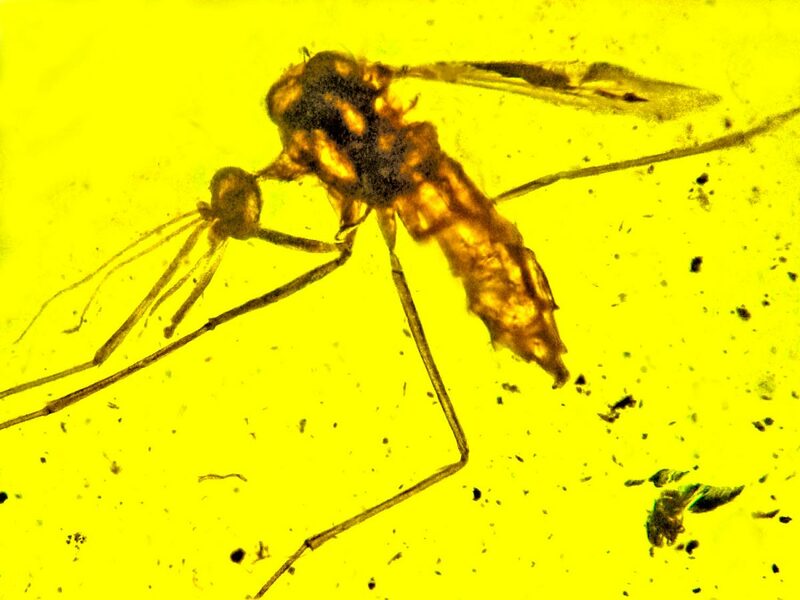 A mosquito dating back to the age of the dinosaurs has been found preserved in amber… just like in Jurassic Park. And it may have been carrying malaria – shedding fresh light on a disease that kills more than 400,000 people a year. The insect became entombed in the tree resin 100 million years ago – and is a newly identified species of the anopheline family. This is the group that carry malaria – adding to a theory that today’s deadly virus played a part in the extinction of the dinosaurs. “Mosquitoes could have been vectoring malaria at that time, but it’s still an open question. The mosquito inhabited tropical forests in what is now Myanmar during the Mid-Cretaceous Period – when T rex and Velociraptor roamed the earth. In the hit movie the prehistoric beasts were brought back to life by extracting DNA from dinosaur blood found in the gut of a prehistoric mosquito that had fed on them. The mosquito described in Historical Biology has been named Priscoculex burmanicus. 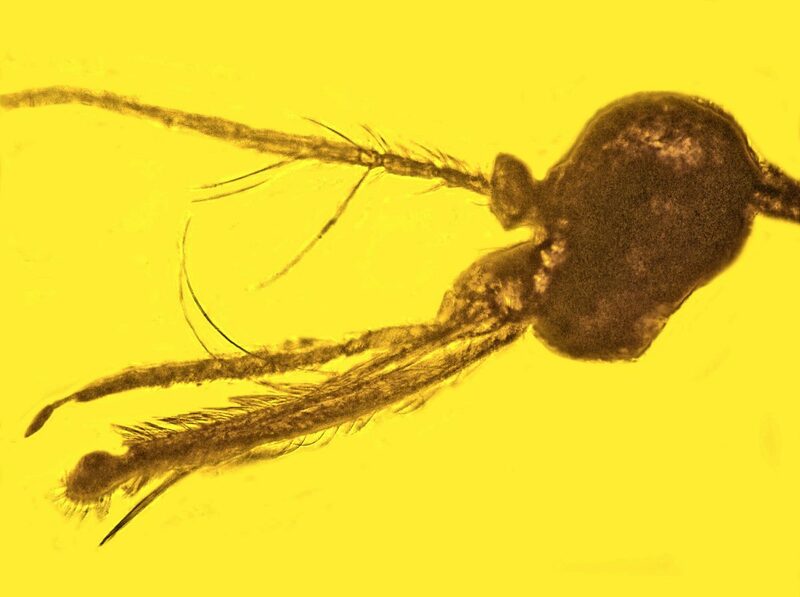 Various characteristics, including those related to wing veins, proboscis, antennae and abdomen, indicate it is an early lineage of the anopheline mosquitoes, they said. It was internationally renowned Prof Poinar who popularised the idea of extracting DNA from insects fossilised in amber. This was adapted by Michael Crichton for the book and movie Jurassic Park. Most malaria, especially the species that infect humans, chimpanzees and gorillas is caused by the parasite Plasmodium. Female anopheles pick this up from infected people or other primates when they bite them to obtain blood needed to nurture their eggs. It is then passed on to the next person, or animal, they snack on. Ancestral forms of the disease may literally have determined animal survival and evolution, according to Prof Poinar. He believes the origins of malaria, which infects animals ranging from humans and other mammals to birds and reptiles, may have first appeared in a biting midge that was found to be vectoring a type of malaria some 100 million years ago. Now he can include mosquitoes as possible malaria vectors that existed at the same time. In a 2007 book, ‘What Bugged the Dinosaurs? Insects, Disease and Death in the Cretaceous,’ Prof Poinar and his wife, Roberta, said pathogen spreading insect vectors from the Cretaceous may have played a vital role in the extinction of the dinosaurs. They wrote: “There were catastrophic events that happened around that time, such as asteroid impacts, climatic changes and lava flows. “But it is still clear that dinosaurs declined and slowly became extinct over thousands of years, which suggests other issues must also have been at work. It is known that mosquitoes did indeed buzz around during the age of the dinosaurs, feeding on their blood. Prof Poinar said scientists have long debated about how and when malaria evolved. He was the first to discover the disease in a 15 to 20 million year old mosquito from the New World, in what is now the Dominican Republic. Understanding the ancient history of malaria may offer clues on how its modern-day life cycle evolved – and how to interrupt its transmission, said Prof Poinar. Since the sexual reproductive stage of malaria only occurs in the insect vectors, he considers them to be the primary hosts of the pathogen, rather than the vertebrates they infect. The first human recording of malaria was in China in 2,700 BC. Some researchers say it may have resulted in the fall of the Roman Empire. In 2017 there were 219 million cases of malaria worldwide, according to the World Health Organisation. Immunity rarely occurs naturally and the search for a vaccine has not yet been successful.